I’ve had a very busy but fun week with grandchildren. Five of them part of the time and two of them all of the time. Two were here for the week and three live next door. We have a path that is very easy to follow, through the woods, connecting our yards. So we’ve had sleep-overs, shopping, baking, movies, ice skating, a tea party, a New Year’s Eve party and cousins just hanging out together. It’s been a fun, busy week. Everyone is gone now. It’s very quiet in here and seems lonely! We’ll get used to it though. 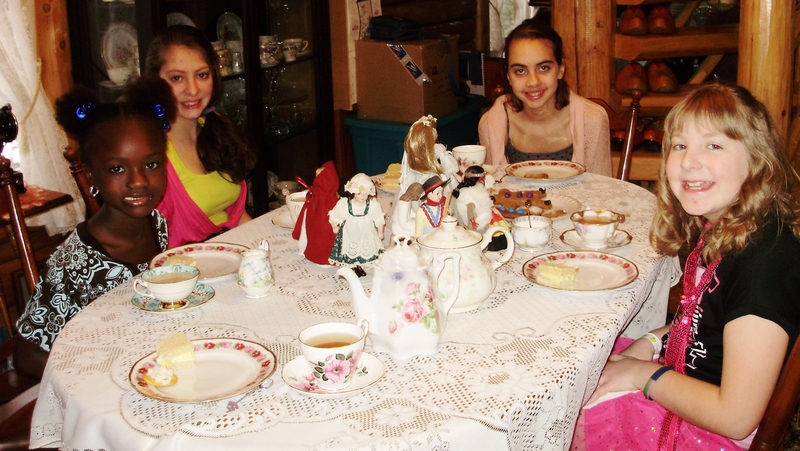 This is a picture from our tea party. I only use the very best for a tea party, lace table clothe and Bone China dishes. The girls feel very special and dress in their best. They get to use a little make-up and they each help each other fix their hair. We don’t have tea parties often but when we do it’s special.This time I made petite egg salad sandwiches, crackers with cheese spread, ginger snaps and gingerbread boys with apple-cinnamon tea. A few of my International dolls made up the center piece for the table. I read/told them the story “The Littlest Orphan and the Christ Baby” by Margaret E Sangster, Jr. This entry was posted in Books, Family, Grandchildren, Tea Party. Bookmark the permalink. Thank you, Sydney, for your comment! I’m so glad you like the tea parties we have. Thanks for your comment. I have no idea of your problem, sorry.